Tonight the Calgary Roughnecks will face-off in the West Division final against the league-leading Saskatchewan Rush at the SaskTel Centre. The Roughnecks advanced to the second round of the post-season following a 15-12 victory over the Colorado Mammoth last Saturday at the Pepsi Center. Dane Dobbie (6g, 3a) led Calgary offensively with a game-leading nine-point effort. Curtis Dickson (4g, 1a) and Wesley Berg (2g, 5a) were the other top goal scorers for Calgary, tallying a combined six goals and six assists. Holden Cattoni (1g, 5a), Tyler Digby (1g, 3a) and Tyson Bell (1g, 1a) rounded out the scoring for the visiting team with one marker apiece. Christian Del Bianco made 38 saves to record his first post-season win and recorded his first playoff point with an assist in the fourth quarter. Saskatchewan finished the regular season with a 14-4 record and have a perfect 10-0 record in the West Division. The Rush last saw action on Apr. 28 when they defeated the Roughnecks by a score of 11-10. Jan. 27/18 at CGY: SAS 13 CGY 12 … Calgary out-scored the Rush 8-2 in the second half but their efforts fell short as Saskatchewan forward Ben McIntosh scored just 46 seconds into overtime. Feb. 24/18 at SAS: SAS 10 CGY 6 … The Rush jumped out to a 4-1 first quarter lead and ended Calgary’s three-game winning streak. Apr. 28/18 at SAS: SAS 11 CGY 10 … The teams were knotted at five goals each heading into the halftime break. 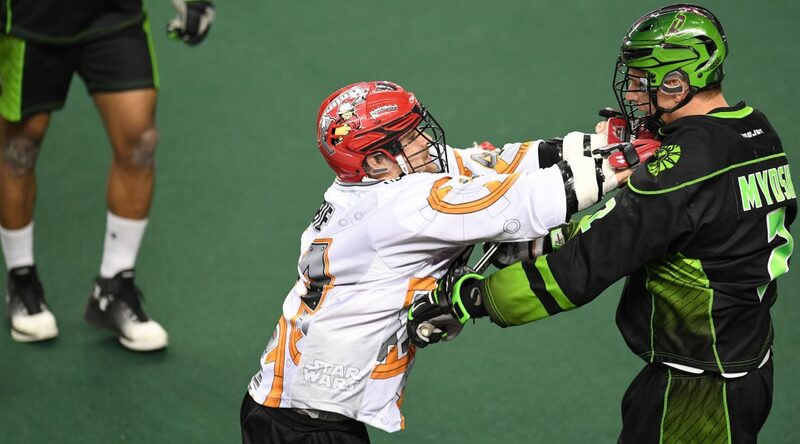 Although Calgary outshot the home team 46-43, the Rush were able to take the lead in the third quarter and maintain the advantage to record the win. POST-SEASON EXPERIENCE: Calgary has a combined 199 games of playoff experience. Mike Carnegie leads all Roughnecks players with 26 post-season games played. Dane Dobbie tops the team in playoff points with 92 (45g, 47a). PLAYOFF RECORD: Calgary has an all-time post-season record of 17-16. The Roughnecks have competed in ten playoff games against Saskatchewan Rush, posting a 3-4 record when playing at home and 0-3 mark on the road. Calgary is 3-1 all-time in playoff overtime games. PLAYOFF MILESTONES: During last Saturday’s 15-12 victory over the Colorado Mammoth we saw a multitude of playoff milestones: Dane Dobbie posted a nine-point effort including six goals and three assists which boosted him past the 50 goal mark and helped him hit 50 assists to surpass 100 playoff points. Greg Harnett scooped up five loose balls for 50 in the post-season. Christian Del Bianco made 38 saves on 46 shots on goal to record his first playoff win. REGULAR SEASON VS. DIVISION: West (5-4), East (3-6). REGULAR SEASON TOP 10: Christian Del Bianco finished the regular season first in the NLL with a 0.793 save percentage and his 10.50 goals against average also tops the league. Dane Dobbie finished first in the NLL with 16 power play goals and his career high of 44 penalty minutes sits fifth in the league. Wesley Berg had a career high of 37 goals, seventh in the NLL, including 11 power play goals, tied for sixth in the league. Berg also had a career high of 49 assists including 18 power play assists, tied for sixth in the NLL. Curtis Dickson is tied for first in the NLL with five shorthanded goals and is eighth in power play assists with 17. He placed first in the league with 292 shots and 76 turnovers. Dickson also wrapped up the season tied for second in the NLL in goals scored with 47 and is part of a five-way tie for first with three game winning goals. He sits seventh in the NLL with 92 points. Tyler Pace ended the season seventh in rookie scoring and in defence scoring with 19. Mitch Wilde placed third in the NLL for defence scoring with 25. Zach Currier wrapped up his rookie season first in the NLL for loose balls with 200 and third in caused turnovers with 33. CAREER YEARS: Thirteen Roughnecks players have recorded career highs in several categories this season: Tyson Bell (11 A including 1 SHA, 2 SHG, 1 GWG, 23 CTO), Wesley Berg (37 G, 49 A including 18 PPA, 86 PTS), Tyler Burton (2 SHA, 90 LB, 56.4 FO%), Holden Cattoni (36 G including 3 PPG and 1 GWG, 40 A including 11 PPA, 76 PTS, 51 LB), Chad Cummings (4 G, 10 PTS, 15 PIM, 2 SHA, 71 LB, 14 CTO), Christian Del Bianco (17 A including 1 SHA, 17 PTS, 34 LB, 788 MIN, 7 W, 530 SV), Curtis Dickson (26 PIM, 3 SHA, 86 LB), Tyler Digby (32 PIM), Dane Dobbie (44 PIM, 87 LB), Riley Loewen (18 G, 28 A, 46 PTS, 57 LB, 5 CTO), Garrett McIntosh (6 G including 1 SHG, 6 A, 12 PTS, 50 LB), Frank Scigliano (2 SHA) and Mitch Wilde (11 G including 2 SHG, 14 A, 25 PTS, 67 LB, 11 CTO). CLIMBING THE CHARTS: This season we saw head coach Curt Malawsky become the most winningest coach in franchise history with 52 victories. He passed Chris Hall’s mark of 46 in the team’s triumph over Colorado on Feb. 10. Several players also climbed the charts for a multitude of franchise records: Defenceman Mike Carnegie is third all-time in franchise games played with 171. Former captain Andrew McBride sits atop the games played list with 198 followed by Jeff Shattler at 183. Alternate captain Dane Dobbie became the franchise’s all-time leading scorer on Jan. 27, 2018. The 31-year-old now has 751 career points (371g, 380a) in 160 games with Calgary. Dobbie is also third in franchise penalty minutes with 237, surpassed only by Geoff Snider with 285 and Andrew McBride with 360. ROSTER MOVES: May 5 – The Calgary Roughnecks placed Creighton Reid on the Practice Player List from the Active List. Placed Mike Carnegie on the Active Roster from the Injured Reserve List.